When I saw this idea on Pinterest, I immediately knew that I needed to do this. My office kitchen never seems to have any forks. I guess that they accidentally get abducted and never break free. 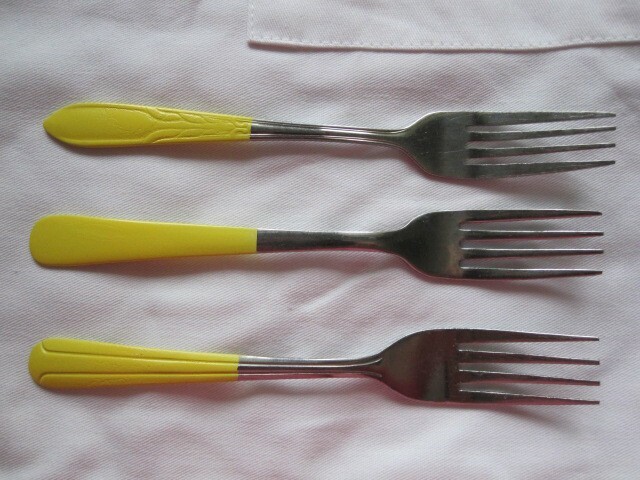 And due to a completely unrelated reason, I have a few unmatched forks. So I thought I’d give them a a makeover. This project took only about 5 minutes, including the 60 seconds to shake up the can of paint. Once I covered the tine-side with some paper and tape, then I gave the handles a quick spray of primer. I let it dry for an hour, as per the paint’s directions, and then sprayed it with a canary yellow. One coat was enough; they already made it through the dishwasher. Don’t they look great? Office lunches are going to be great, and I’ll never have to eat my salad with chopsticks again! Does whatever a bowling ball can! Check out my new garden friend. 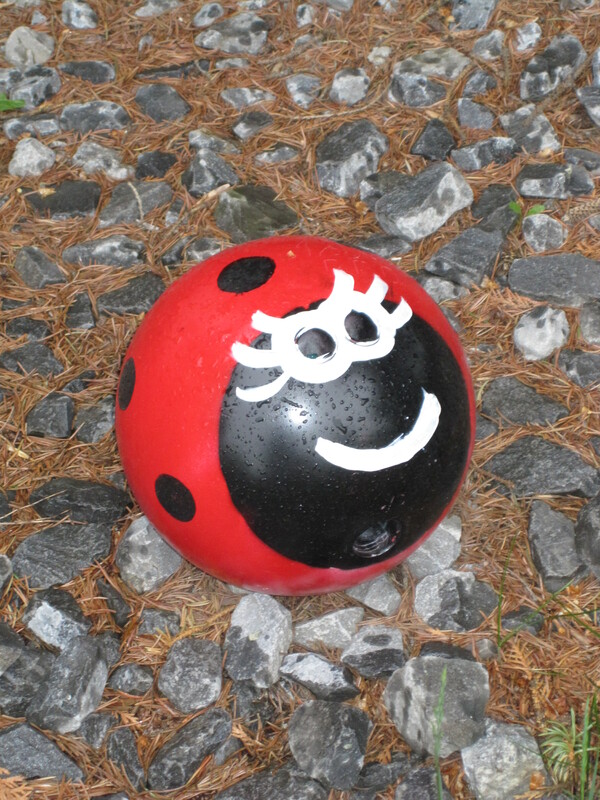 A while back I made these Bowling Ball Ladybugs and it seems that one of the ladies got herself a beau. Spidy was so easy to make. 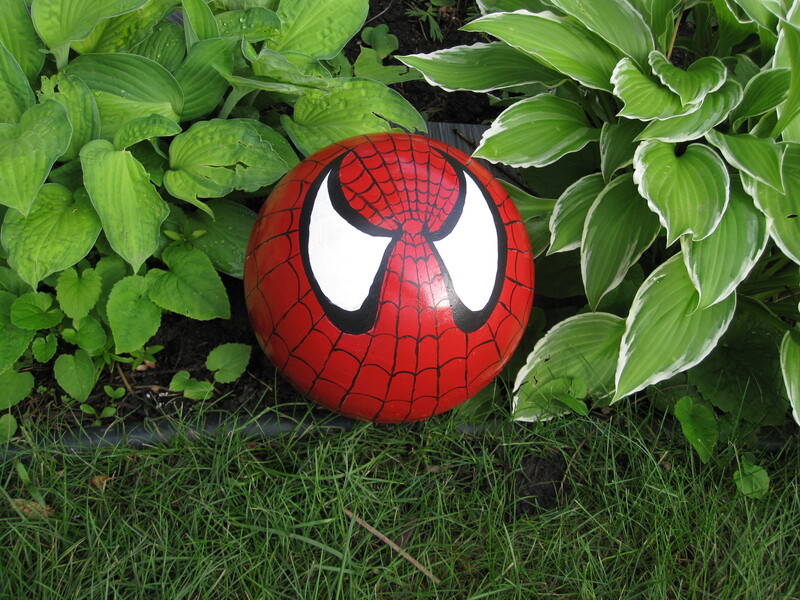 All you need to do is spray paint a bowling ball red, then get your awesome friend to hand paint Spider-Man’s face on it. My artistic Superman carefully painted every web onto this guy, and I think the results are amazing! Don’t forget to give him a good spray of clear coat to protect him from the elements. Lady and Spidy make a cute couple! Here’s a photo of my inspiration. My actual mat is the negative of this mat, the lettering is painted. I printed the text in Word using the “stencil” script. Then I traced the text onto some thin cardboard (cereal box) with a utility knife. I used a light coat of spray adhesive to keep the cardboard stencil on the mat. Without the spray adhesive I found that the spray paint snuck under the stencil. 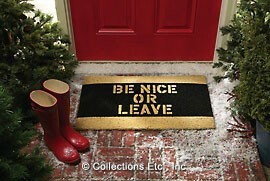 Just coat with spray paint, let dry and you have yourself a custom welcome mat. I was completely inspired by a photo I saw on Pinterest. 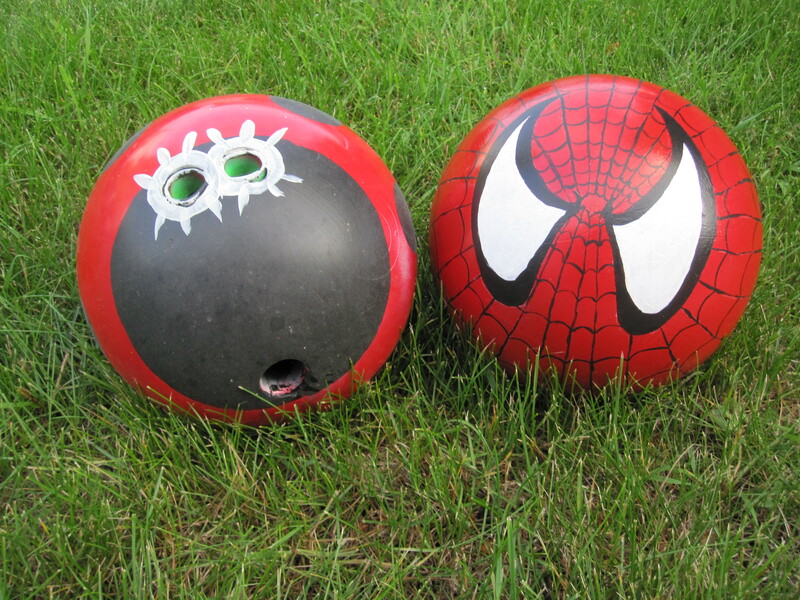 I managed to find a few bowling balls on kijiji and picked up some paint. 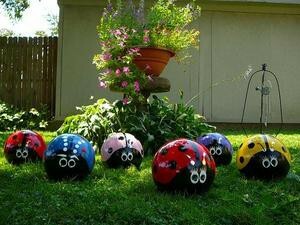 After a little googling and some guess and testing, I’ve come up with a really easy way to make these adorable lady bugs. I rigged up an old crocket spike in a patio umbrella stand, to hold the bowling ball so I could paint around the entire ball at once. Paint the ball with a good coat of primer. Once it has completely dried, paint with the red paint. This could take two coats. The ladies at the hardware store suggested the 2x brand paint, and I agree, it works great. I used a bowl as a template and drew a circle in pencil on the ball. I then hand painted the circle in black. Next I sponged on some black dots. Once the black dried, I painted some eyes with white. I considered spraying the whole thing with a clear coat, but for some reason it made the paint crackle. Since I used outdoor paint, I decided it should be able to withstand the weather.